A new study on the installed costs of solar photovoltaic (PV) power systems in the U.S. shows that the average cost of these systems declined significantly from 1998 to 2007, but remained relatively flat during the last two years of this period. Researchers at the Department of Energy’s Lawrence Berkeley National Laboratory (Berkeley Lab) who conducted the study say that the overall decline in the installed cost of solar PV systems is mostly the result of decreases in nonmodule costs, such as the cost of labor, marketing, overhead, inverters, and the balance of systems. “This suggests that state and local PV deployment programs — which likely have a greater impact on nonmodule costs than on module prices — have been at least somewhat successful in spurring cost reductions,” states the report, which was written by Ryan Wiser, Galen Barbose, and Carla Peterman of Berkeley Lab’s Environmental Energy Technologies Division. Installations of solar PV systems have grown at a rapid rate in the U.S., and governments have offered various incentives to expand the solar market. “A goal of government incentive programs is to help drive the cost of PV systems lower. One purpose of this study is to provide reliable information about the costs of installed systems over time,” says Wiser. The study examined 37,000 grid-connected PV systems installed between 1998 and 2007 in 12 states. It found that average installed costs, in terms of real 2007 dollars per installed watt, declined from $10.50 per watt in 1998 to $7.60 per watt in 2007, equivalent to an average annual reduction of 30 cents per watt or 3.5 percent per year in real dollars. The researchers found that the reduction in nonmodule costs was responsible for most of the overall decline in costs. According to the report, this trend, along with a reduction in the number of higher-cost “outlier” installations, suggests that state and local PV-deployment policies have achieved some success in fostering competition within the industry and in spurring improvements in the cost structure and efficiency of the delivery infrastructure for solar power. Other information about differences in costs by region and by installation type emerged from the study. The cost reduction over time was largest for smaller PV systems, such as those used to power individual households. Also, installed costs show significant economies of scale. Systems completed in 2006 or 2007 that were less than two kilowatts in size averaged $9.00 per watt, while systems larger than 750 kilowatts averaged $6.80 per watt. Installed costs were also found to vary widely across states. Among systems completed in 2006 or 2007 and less than 10 kilowatts, average costs range from a low of $7.60 per watt in Arizona, followed by California and New Jersey, which had average installed costs of $8.10 per watt and $8.40 per watt respectively, to a high of $10.60 per watt in Maryland. Based on these data, and on installed-cost data from the sizable Japanese and German PV markets, the authors suggest that PV costs can be driven lower through sizable deployment programs. The study also found that the new construction market offers cost advantages for residential PV systems. Among small residential PV systems in California completed in 2006 or 2007, those systems installed in residential new construction cost 60 cents per watt less than comparably-sized systems installed as retrofit applications. The study also found that direct cash incentives provided by state and local PV incentive programs declined over the 1998-2007 study period. Other sources of incentives, however, have become more significant, including federal incentive tax credits (ITCs). As a result of the increase in the federal ITC for commercial systems in 2006, total after-tax incentives for commercial PV were $3.90 per watt in 2007, an all-time high based on the data analyzed in the report. Total after-tax incentives for residential systems, on the other hand, averaged $3.1 per watt in 2007, their lowest level since 2001. Because incentives for residential PV systems declined over this period, the net installed cost of residential PV has remained relatively flat since 2001. At the same time, the net installed cost of commercial PV has dropped — it was $3.90 per watt in 2007, compared to $5.90 per watt in 2001, a drop of 32 percent, thanks in large part to the federal ITC. 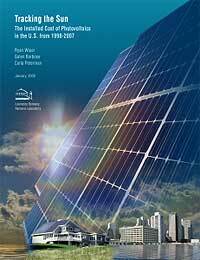 “Tracking the Sun: The Installed Cost of Photovoltaics in the U.S. from 1998–2007,” by Ryan Wiser, Galen Barbose, and Carla Peterman, may be downloaded from http://eetd.lbl.gov/ea/emp/reports/lbnl-1516e.pdf. The research was supported by funding from the U.S. Department of Energy’s Office of Energy Efficiency and Renewable Energy (Solar Energy Technologies Program) and Office of Electricity Delivery and Energy Reliability (Permitting, Siting and Analysis Division), and by the Clean Energy States Alliance.